Kidneys are one of the primary organs of body. They are associated with excreting waste, maintaining the pH level, as well as producing hormones, among other functions. 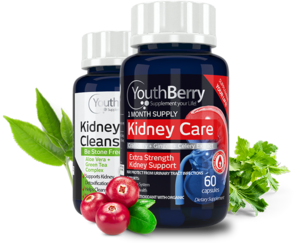 YouthBerry’s Kidney Health supplements help you cleanse and care for your kidneys with 100% natural herbs and extracts. Kidney disease is most often caused by diabetes or high blood pressure. Both of these health problems can cause permanent damage to your kidneys. 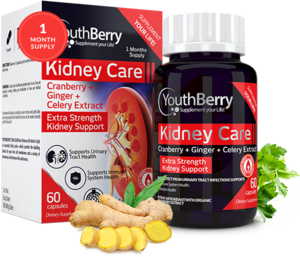 YouthBerry’s Kidney Care formula has Cranberry Ginger+ Celery extract that aids your urinary tract health. It also has Vitamin C and other anti-oxidant properties, which are beneficial in your fight against heart disease and stroke. 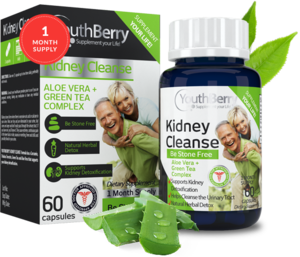 YouthBerry’s Kidney Cleanse formula has a Curcumin, Tribulus Terestris, Green Tea and AloeVera that supports your kidney detoxification. It relieves you of kidney stones, which are likely to cause you tremendous pain. Kidney Cleanse also acts as a natural herbal detox and cleanses the urinary tract.